There is maintenance in providing water for wildlife. 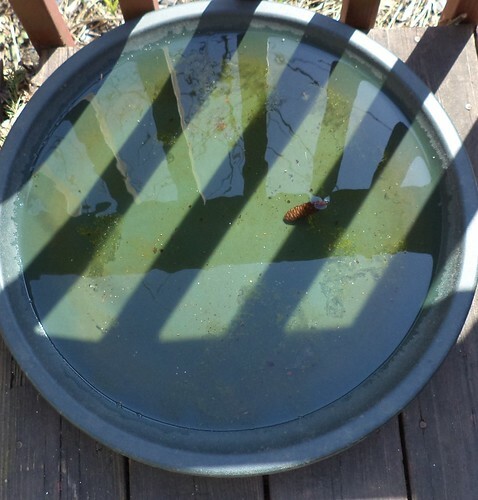 You can just toss a birdbath out onto the deck and fill it whenever you see it getting low. That can work. The problem is, a bathing bird will introduce all sorts of stuff into the water. 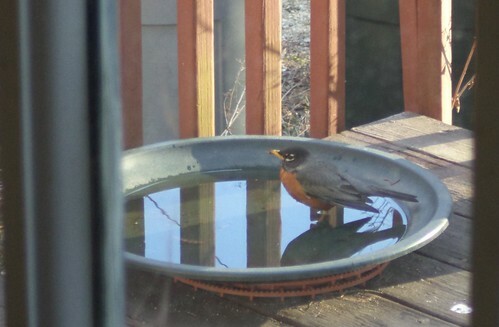 It's gratifying to me that the birds are coming to my yard specifically for the bird bath. I've mentioned it before about robins but they are a messy bird. 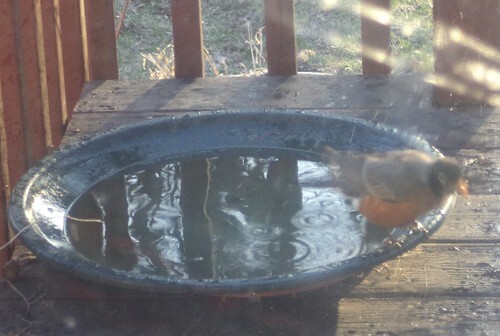 Cardinals and other birds don't seem to let the water fly when they are bathing. Robins are like a big ol' soggy Golden Retriever. "Let me shake all this off and who cares where it goes." They will also poop in the bath which doesn't lend itself to extremely sanitary water. It's recommended that water for the bird bath be left out for 24 hours which allows the chemicals we use to keep our water safe to evaporate. I have to admit that if I come home from work or notice, as I am today, that the bath is low on water, I'll just grab a pitcher and refill it. I figure the chemicals will evaporate better outside with sunshine than on the counter in my kitchen. 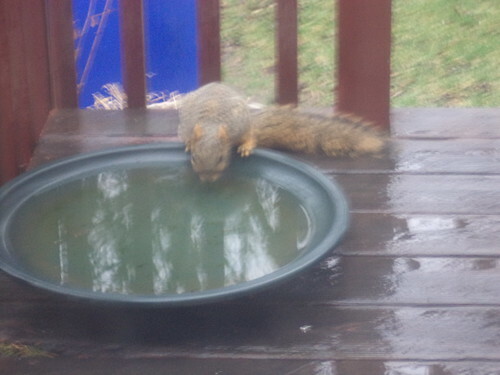 It's important to consider this aspect of providing water when I have others who wander by. I keep the camera in the office with me when I'm here so I can take advantage of whatever I happen to see out the window. But they know. I can sit here and watch them, but the second I pull that camera up to take a photo, they are off. I was lucky on Thursday afternoon, however. 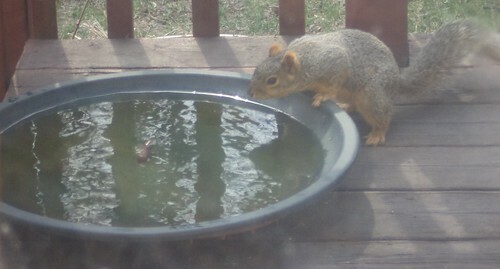 I'm going to call it a year for trying to take squirrel photos at the bird bath. I don't think I'll get a better one. They came even in the winter when the water was frozen solid and "getting a drink" meant gnawing on the edges of the ice block. So they have to be thrilled, in their own way, that there is liquid water available now. You see the thing floating in the bath. That's a pinecone. I have no idea how it got there because there isn't a pine tree near this section of the house, but it's there. I need to thoroughly clean the bath. There is algae in the dish along with the pinecone. I should thoroughly scrub it without using soap. I have got a stiff bristle brush which would do the trick. It kind of reminds me of a miniature pond, algae and other stuff floating in it. So, I think that will be this weekend's task, in addition to all the other things I have on the agenda. Time to make it green only because that's the color of the plastic.